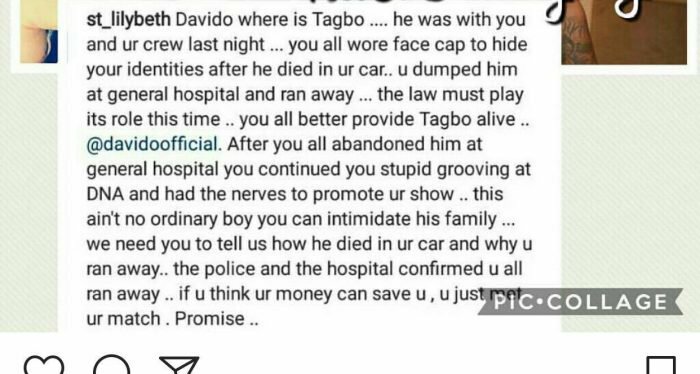 It's That Time of the week again, Fresh Celebrity Clash, Most Followed Nigeria Singer Davido is on a fresh Scandal, and this Won’t go down well with his fans, Nollywood Actress Caroline Danjuma just laid a serious Allegation on Davido, And Trust Ebiwali i got the news First hand, According to the actress. 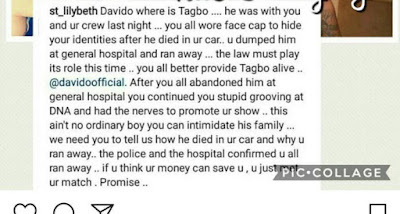 The singer and some of his friends had gone for partying at DNA club in Lagos, including her Bro, Tagbo, But when they return Tagbo was no where to be found, rather a call came in that he was dumped at the General hospital dead..
What led to his death is yet to be known, but She added that Davido and his friends abandoned him, wore caps to covers their faces and took on their hills.. This is really sad, And considering the fact that the father of 2 just celebrated a great achievement of hitting 5million followers, We are scared it may reduce his followers, and turn off fans.. Meanwhile the unborthered singer is busy sharing photo of his upcoming #30billion gang.